Moto G7 Plus and Redmi Note 7 Pro both are the latest and mid-range as well as powerful mobile phone. But their specification and features makes them little bit different. Let’s begin the comparison between Moto G7 Plus vs Redmi Note 7 Pro. I Hope you will like the comparison provided here and this guide help you to buy the smart mobile. The Motorola Mobile Company has recently launched the most attractive and finest smartphone Moto G7 plus in UK. It is the best mid-range mobile in new era. It is quite honestly the first budget smart phone that is a powerful SOC, covered battery life fast and clutter free Android. It has a durable a large 6.2 inch full HD display with 2270 X1080 Pixel resolutions. There’s minimal bezel at the top of the display with the front facing camera contained in a teardrop notch which cuts in to the display. At the bottom of the screen there is thicker bezel which companies the Motorola brand name. It equipped Qualcomm Snapdragon 636, octa core processor. It has 4 GB RAM and 64 GB Internal storage which can be expandable. It supports the latest Android version 9 Pie. It supports all basic connectivity including Wi-Fi, Bluetooth5.0, GPS and others. It has a Dual back camera 16+5 MP and front 12 MP. It has a dual SIM slot which supports Nano SIM. It consist 3000 mAh Fast charging battery. Moto G7 Plus has been released in 1 March 2019 in the UK with the least prices £269. The Xiaomi has been launched Note 7 Pro In India with the biggest and most apparent changes. It is a mixture of good design, latest hardware and handy feature. It is the latest mid- range smart phone that looks like flagships. It has 6.3 Inch Full HD+ Display with resolution 1080×2340 Pixel. It has Gorilla 5 protection on both sides, with a body coloured metal rim running around the edges. It equipped Qualcomm Snapdragon 660 Octa Processor. It comes with 3GB RAM and 32 GB Internal Storage, 4GB RAM and 64 GB Internal Storage, 6 GB RAM and 64 GB Internal Storage which can be expandable. It supports latest Android version 9 Pie and MIUI. It supports all basic connectivity Wi-Fi, Bluetooth 5.0, GPS and others. It has a dual back camera 48 +5 MP and front camera 13 MP. It has a Hybrid Dual SIM slot which supports Nano SIM. It consists 4000 mAh fast charging battery. Redmi Note 7 Pro has been launched on 28 February with the starting price Rs 13,999 for 4GB+64GB and the 6GB+128GB variant is priced at Rs 16,999. Motorola Moto G7 Plus design is not most attractive but the build quality is very solid. It has glass on front and back as well as an aluminium frame in the middle that makes the phone too protective. The power and volumes keys are set on the right side of the mobile that is why you can easily tap the finger on the power and volume button. It has large 6 . 2 inch display which dimension is 157×75.3×8.3 mm and weight 176 grams. It has a headphone jack on its base with a speaker and USB-C port. On the back side there are the dual rear camera and a fingerprint scanner as well as Motorola logo. Whereas Xiamoi Redmi Note 7 Pro is designed with 2.5 D curved Gorilla Glass 5 Protection on both side and a body coloured metal rim round the edge in the middle that is why the mobile is so solid. It has 6.3 inch large displays which dimension is approximately 157×75.3×8.3 mm and weight 186 grams. The lock button and volume button are situated in the right side of the phone that is why you can easily hold and tap the button. The camera shape of this mobile is vertical like as IPhone. There are the fingerprint scanners in the middle on the back side therefore you can easy to hit. Moto G7 Plus comes with 6.2 inch full HD display with 2270 X1080 Pixel resolutions. There’s minimal bezel at the top of the display with the front facing camera contained in a teardrop notch which cuts in to the display. At the bottom of the screen there is thicker bezel which companies the Motorola brand name. It seems to be the device with the best display. It LTPS technology’s provide a lower consumption as well as controlled temperature ranges. Whereas Redmi Note 7 Pro has 6.3 inch Full HD big display+ LTPS with a resolution 1080×2340 pixel. LTPS help to provide in- Cell display consumes less power, has faster refresh rates and generates less heat. It makes with 5 protections Gorilla Glass . It has a U-shaped notch on the front. Big screen makes Reading, browsing internet and watching videos more pleasing experience and the high resolution make images, videos and text more sharp. Moto G7 Plus is a dual camera phone that back camera is 16 + 5 Mega pixel with f/2.0 aperture. You can take sharp and clear picture at once a click. . Dual camera is useful in improving certain effects like blur, zoom and wide angle photos. The front camera is 12 MP with dual tone LED Flash therefore you can take clear selfie in the night or less light and video chat with the help of front camera. Redmi Note 7 Pro also comes with dual came where the rear packs a 48 mega pixel primary camera with an f/1.79 aperture and 5 Megapixel cameras. The rear camera setup has autofocus. It has 13 MP front cameras for selfies. Dual camera is useful in enhancing certain effects like blur, zoom and wide angle photos. You can take sharp and clear pictures in low light with the help of flash light. You can easily take your own photos and do video calling with the help of front camera. Moto G7 equipped with Qualcom Snapdragon 636 Octa core process that runs 1.8 GHZ which provide good performance without slowdown user interface. So you can play fast heavy games like as PUBG, Apex Legends as well as enhance the gaming experience. Whereas Redmi Note 7 Pro equipped with Qualcomm Snapdragon 660 octa core processor that runs 2.2 GHZ. More cores results in better parallelism that means more tasks can be processed in parallel without slowing down the user interface. That is why you can perform all over the heavy task like as playing PUBG games. Moto G7 Plus comes with 4 GB RAM and 64 GB Internal storage with a micro SD dedicated therefor you can expand internal memory up to 128 GB. The memory of this phone is enough to store more applications, songs, videos, photos and software program. You can also perform various tasks in a mean time. Whereas Redmi Note 7 Pro comes with 3GB RAM and 32 GB Internal Storage, 4 GB RAM and 64 GB Internal Storage and 6 GB RAM and 64 GB Internal Storage with a micro SD Slot that is why it may be expandable up to 128 GB. More storage capacity allows you can store more applications, songs, videos, photos and software program. With the help of lots RAM you can run more than one applications at a time which makes the mobile faster. whereas Redmi Note 7 Pro consisting 4000 mAh battery that quick charge fully with in 60 min. Moto G7 Plus and Redmi Note 7 Pro both supports all basic connectivity like as 4G,3G, Volte, Wi-Fi, Bluetooh5.0, GPS, Dual SIM, LTE Cat 12 download/Cat 13 upload and other connectivity. 3G and 4G enable handset give you more download speed and a faster internet experience. Wi-Fi allows you to use your internet connection on your wifi enabled laptop. Bluetooth enables you to wirelessly listen to music and calls using Bluetooth headsets. Volte allows you to make calls over 4G network. GPS used for determine your location and help you to search direction to a place. Moto G7 Plus and Redmi Note 7 Pro both have a Fingerprint sensor on the back side and other useful sensor like as Ambient light sensor, Gyroscope sensor and 3D face recognition sensor. Their sensor works so smoothly. Moto G7 Plus has recently launched on 1st March 2019 in UK with the starting price £269 that the Indian value is 24,457 INR whereas Redmi Note 7 Pro has been launched on 28 February with the starting price Rs 13,999 for 4GB+64GB and the 6GB+128GB variant is priced at Rs 16,999. 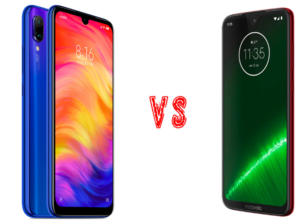 After the testing overall comparison between Moto G7 Plus vs Redmi Note 7 Pro, the Redmi Note 7 Pro is the best and cheap mobile of the year 2019. First of all talking about processor, the Redmi Note7 pro processor is highly advance than Moto G7 Plus. Highly advance processor enhances the mobile performance. In term of display the Redmi Note7 Display is larger than MotoG7 Plus. Talking about the built quality the Redmi Note 7 Pro built quality is little solid than Moto G7 Plus. The battery power of Redmi Note 7 is 1000 more than MotoG7 Plus. Therefore you can use the battery 1 day without charging. In terms of the connectivity or sensor both are equal. But the biggest difference is their price. The starting price of Moto G7 Plus is 24,457 INR where the starting price of Redmi Note 7 pro is 13,999. Redmi Note 7 Pro is the overall winner today so I would like to buy this mobile. Whether you would like to go please share you’re thought in the comment Box.